Sakac Hall, the residence hall for MSMC’s freshmen girls, has been under renovation for the majority of the Fall semester due to the presence of unhealthy amounts of mold. After discovering the mold, residents of Sakac were promptly displaced on Sept. 23, and placed in hotels off campus in Newburgh and Fishkill. Following a week in the hotels the Sakac residents were moved again, and given the option for immediate temporary housing or working from home for the next week. 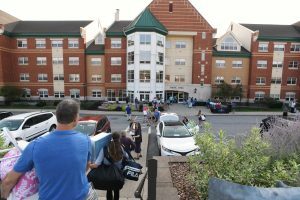 All who went home for the week were placed in temporary housing across campus in locations such as the Garden Apartments, the College Courts, Guzman, the Dominican Center and houses on Powell Avenue that were previously offices. Sakac residents are expected to remain in the temporary housing for the rest of the semester. Although most of the residents are now settled into a routine with the promise of no further disruptions from this incident, much damage has already been done. During the period that some Sakac residents were still located off campus, many were concerned about the potential effects this ordeal could have on the grades and social experience of those affected, all of whom were freshmen still adapting to the college experience. Sakac resident and Mount freshman Rebecca Herrera, who was relocated three times during this ordeal, believes that her grades were greatly affected by the situation. “After we moved out, in a certain class I kept getting 50s on the homeworks and I didn’t know why I was failing,” said Herrera. Similar sentiment could be felt by other freshmen with varying levels of severity. “In a sense yes, the mold has affect my grades a bit. Not to the point where it’s terrible but to the point I am more worried than usual about failing,” said Victoria Archuleta, another Mount freshmen and Sakac resident. As for the possibility that the incident could affect the adaptation of the transitioning freshmen, the same feelings were expressed, especially in regard to the bus schedule that was set up to accommodate freshmen relocated off campus. Archuleta had similar complaints about the buses. “I remember once it left seven minutes early and another time, when no one was on board, it left right as I got off the elevator,” said Archuleta. Despite the school’s efforts to remediate the situation, many freshmen girls seem to believe more could have been done. Even with all the negative sentiment towards the ordeal, there is still a silver lining. Out of the three freshmen interviewed, despite all of the problems they have faced during their short time at MSMC, none of them have considered transferring. A clear indicator that although this incident has caused some problems, the school still has much to offer.